DJ ProDecks is a completely free audio editing application which allows you to mix your music just as a professional DJ would do. This program comes packed with a ton of useful and professional-quality features. 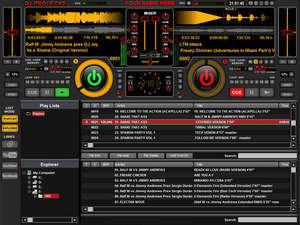 DJ ProDecks is well-structured and provides a few excellent features. The main layout of the program includes two panels; one which includes the playback list and the other the controls. For security reasons, you should also check out the DJ ProDecks download at LO4D.com which includes virus and malware tests. Additional screenshots of this application download may be available, too. DJ ProDecks has a presence on social networks.